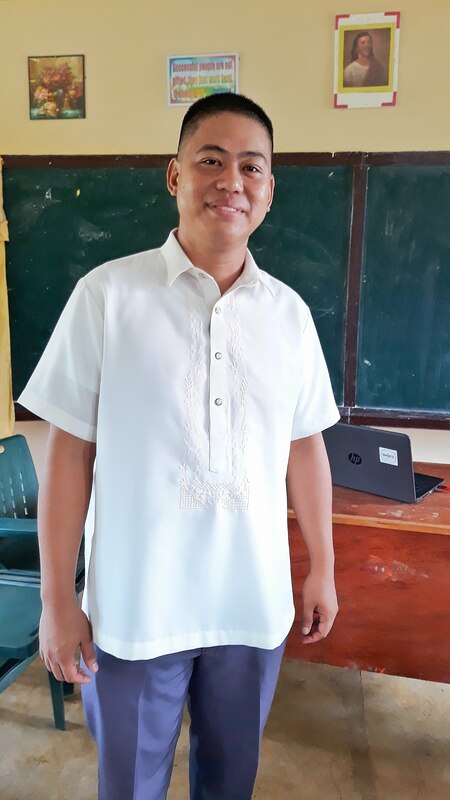 On his first assignment as principal, Gregorio Legal, 31, an educator with over eight years of teaching experience in public schools in Masbate, was assigned to the Mary Perpetua E. Brioso National High School in Brgy. Tigbao, municipality of Milagros. It is not unusual for new public school teachers and school heads to be sent to the most challenging communities on their first appointment. To some it is a rite of passage; to others, a test of endurance. To Legal, it was both. Before this, he had worked at the Department of Education’s division office in Masbate City and the bulk of his work was administrative in nature, although it required a lot of trips to last mile communities in the province as well. His new assignment, however, was far more challenging: he will manage a school that lacked classrooms and access to basic utilities such as electricity. “One of the problems I found was the absence of electricity. We, teachers, know how hard it is to teach without power. We cannot create instructional materials because we could not use a computer or a printer. Submitting reports is also arduous; we would wait until the evening when electricity is available in our village,” he shared. “I almost cried when I saw the situation of our school. I thought to myself: finding ways to improve the condition of our school would be a huge challenge on my part,” he added. Without paved roads connecting it and the rest of the municipality, Brgy. Tigbao has become isolated geographically. This is one of the main reasons why electrical facilities could not yet reach the community. As a temporary solution, the government provides limited power supply from a generator operated by the National Power Corporation. Unfortunately, it could only be run for a limited period each day, from 5:30pm to 10:30pm. For the rest of the day, most residents deal with their day-to-day tasks without the help of electricity, while the very few who can afford it either draw power from their own small generators or solar panels. Since classes are held during the day when there is no power, Legal and his teachers fulfill their duties sans the aid of modern teaching tools such as computers, since these require electricity. “We still employ traditional teaching methods here [because we don’t have electricity]. Even if we used our laptop, its battery power won’t last long. Then, we will have to wait until the evening before we could charge it,” explained Legal. For subjects like Mathematics and the languages, traditional style of teaching may not be much of a problem but for Science and ICT ━ especially in the K to 12 curriculum which encourages the integration of computer technology in pedagogy ━ the chalk-and-board approach may not be enough. “Our students lack the motivation to study because we lack the tools required to teach them modern concepts such as technology,” he said. With help from the community, Legal was able to crudely build a generator out of a donated engine from a broken farm tractor and an alternator which the school had bought. “Our generator is also unreliable. Its voltage often fluctuates, and this damages the appliances we use,” added the teacher. “It is also costly to operate since it requires a large amount of diesel fuel to be able to run the entire day. Fuel is expensive here because we’re quite far,” he explained. Legal realized that with the school’s limited funds, he has to find a more sustainable solution elsewhere. He turned to the Internet for clues. “I learned over the Internet about One Meralco Foundation’s electrification program for schools without access to electricity. Since our school has a big student population, I was confident that we would pass OMF’s criteria,” he recalled. “I messaged the Facebook page of OMF and inquired about the requirements for applying for its school electrification program,” added Legal. After completing the requirements, Legal did not leave anything to chance. He hopped on a “RORO” (roll-on, roll-off) bus, and travelled more than eight hours to Manila. “I personally submitted the documents to OMF in Ortigas and was glad that [the manager in charge of the program] accommodated me. He explained to me how candidate schools are evaluated. I returned to Masbate full of hope that our school would soon have power,” he said. Convinced that the school badly needed electricity, OMF sent a team to Masbate to assess the readiness of the school and the community for a full-blown solar electrification project. “We were glad that not only did the activity achieve positive results, it also led us to discover three more schools in the province that had the same need and were also qualified,” explained Jeffrey O. Tarayao, president of OMF. Last July, OMF completed the installation of 1-kilowatt solar photovoltaic (PV) systems in Mary Perpetua E. Brioso National High School, Amotag National High School, Cantil Elementary School and Magcaraguit Elementary School. Apart from the solar photovoltaic equipment, OMF also turned over multimedia packages consisting of a 49-inch LED TV, a laptop computer and a printer-scanner-photocopier machine to each of the newly energized school. 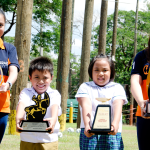 These were donated by employees of Meralco through their monthly contributions to the Meralco Employees’ Fund for Charity, Inc. (MEFCI), a non-profit institution founded by Meralco employees for charitable purposes. “My gratitude to Meralco and One Meralco Foundation is beyond words. I cannot fully express my joy because they gave us more than what we had asked for,” Legal said. A lighting ceremony was held at Legal’s school in August to signify OMF’s official turnover of donations to the four beneficiary schools. 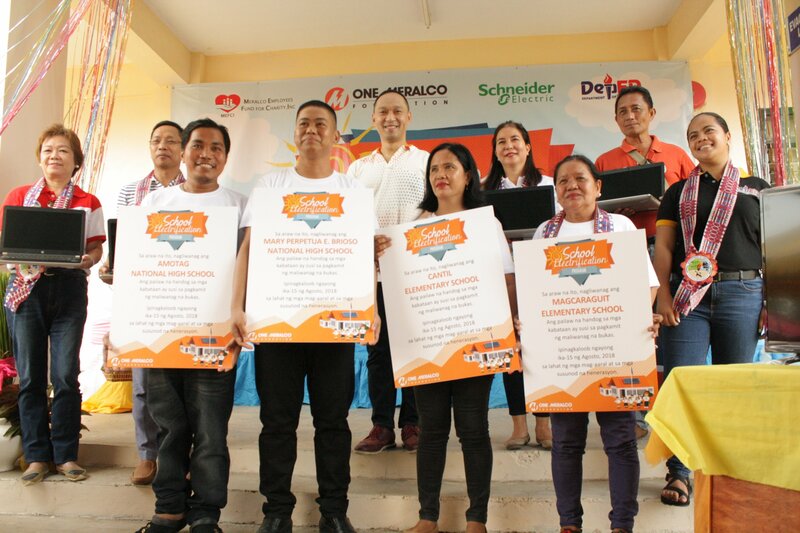 It was attended by Meralco and One Meralco Foundation representatives and the schools division superintendent of DepEd Masbate province, Jose L. Doncillo. 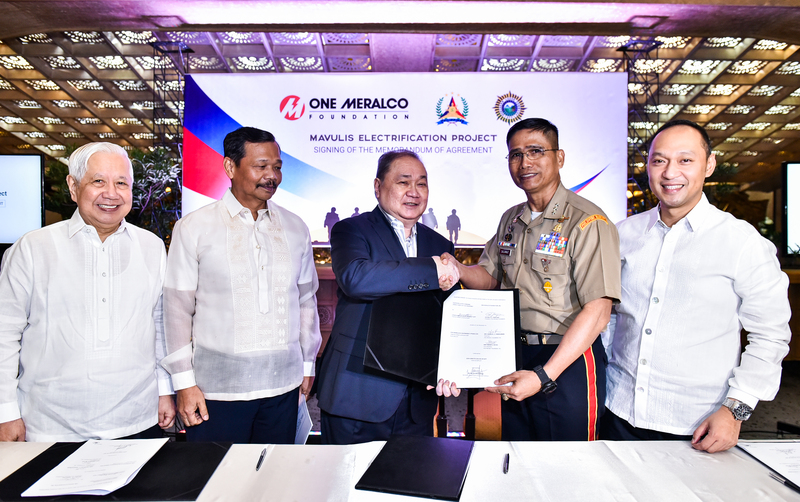 “For years, we have been looking for partners in the private sector to help us address this challenge affecting mostly remote schools, and we are fortunate that One Meralco Foundation has reached out to us with its school electrification program,” said Doncillo. “We believe that electrification will improve the learning conditions in these schools. Hopefully this will translate to better performance by the students,” he added.